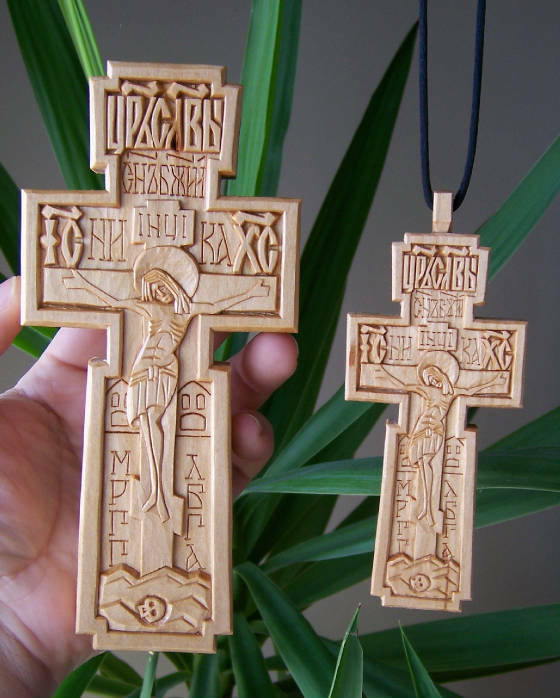 Here is a picture of two Russian Orthodox crosses I've carved in linden wood. They are the same except for size. The cross says in Slavonic, "King of Glory" at the top. Below that it says "Son of God." IC XC are Greek abbreviations for Jesus Christ. NIKA is often seen with IC XC and together they mean "Christ is victorious." On the lower part of the cross, you'll see Slavonic letters that look like MLRB, these indicate the phrase "The Place of the skull has become paridise." Many times letters that look like "r" and "a" are shown with a skull at the bottom, this represents the skull of Adam. Many times you'll also see letters that look like "k t r r" these indicate the sponge and spear and the Mount of Golgotha. All this work is done by hand. How do you make something like this? Start with a pattern and rough out the design. Carve all the background down to the same depth. The fun part is the detail carving done with tiny chisels. All in all it took me about 8 hours of carving for each one. 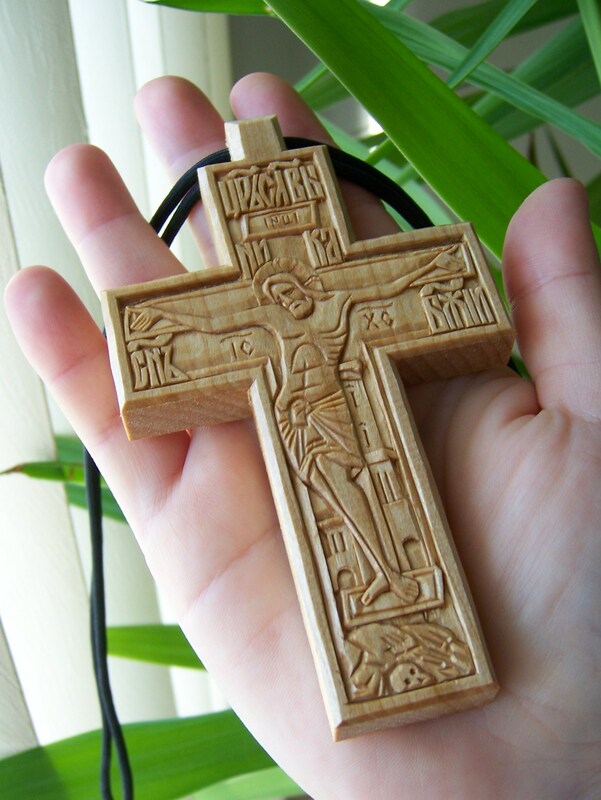 Here is another style of carved Russian Orthodox cross. Did you notice that it says the same thing the one above does? The style is just a little different. 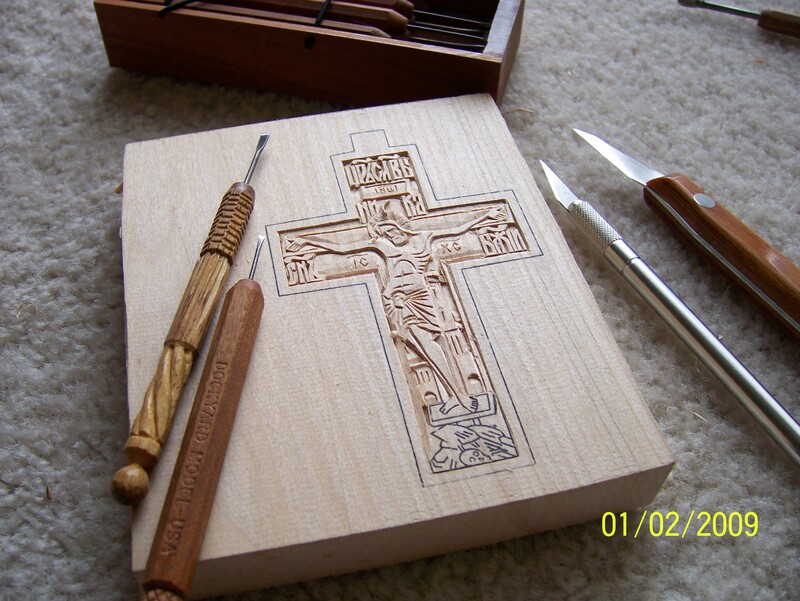 Below is a picture of the tools I've used to carve. When working with details this small, it is hard to beat micro chisels (either purchased or homemade) and a sharp knife. You might have noticed that I carve the handles of my chisels. I do this so I can quickly select the right one. Do you want to carve one? I'll show you how. Please click here.